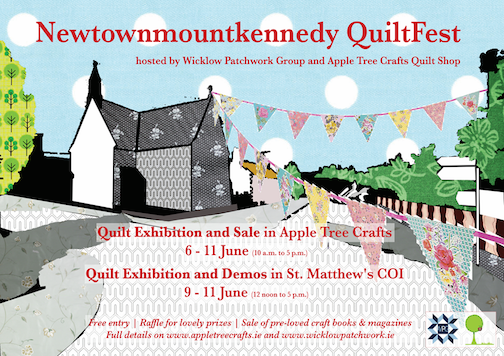 Newtownmountkennedy QuiltFest will be hosted by Wicklow Patchwork Group and Apple Tree Crafts Quilt Shop (www.appletreecrafts.ie) from 6th to 11th June 2017. An Exhibition and Demos of the work of Wicklow Patchwork Group will be held in St Matthews Church (COI), Newtownmountkennedy from 9th to 11th June 2017. There will also be an Exhibition and Sale at Apple Tree Crafts Quilt Shop from 6th to 11th June 2017. Please click here for details of entry form/s, quilt labels and instructions. Further information and entry forms will also be available at the WPG meeting on 20th May and from Apple Tree Crafts. We are looking for volunteers to supervise the Exhibition and we hope to put in place a rota for the three days. If you are willing to volunteer your time for a couple of hours, please contact admin@wicklowpatchwork.ie.